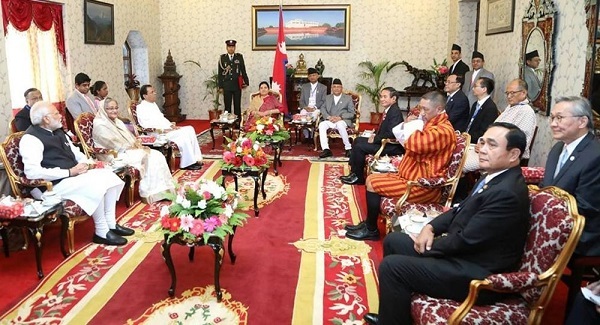 Indian Prime Minister Narendra Modi along with the leaders of five member countries of Bay of Bengal Initiative for Multi-Sectoral Technical and Economic Cooperation (BIMSTEC) jointly called on Nepal’s President Bidhya Devi Bhandari on the sidelines of their summit here on Thursday. Modi arrived here on Thursday morning to attend the 4th Bay of Bengal Initiative for Multi-Sectoral Technical and Economic Cooperation (BIMSTEC) Summit. The dignitaries were welcomed by Nepal President’s advisor Sushil Pyakurel and Secretary at the Office of the President Binod KC among others. Nepal President Bhandari has organised a luncheon programme in honour of the foreign delegates prior to the commencement of the summit later Thursday. Apart from Indian PM Narendra Modi, Thailand PM Prayut Chan-o-cha, Bangladeshi PM Sheikh Hasina Wazed, Myanmar’s President Win Myint, Chief Advisor to the Interim Government of Bhutan Gyalpo Tshering Wangchuk and Sri Lankan President Maitripala Sirisena attended the luncheon programme. Nepal Prime Minister KP Sharma Oli among other high level government officials were also present at the President’s office for the programme. The BIMSTEC is a regional grouping comprising Bangladesh, India, Myanmar, Sri Lanka, Thailand, Bhutan and Nepal. The BIMSTEC grouping accounts for 22 per cent of the global population.